Say hello to a new great way of serving tacos! Sharp and sophisticated, these awesome stainless steel taco holders are a great way to serve or display your tacos till you’re ready to dig in. They can hold up to four tacos in its fold so just load up with the fillings of your choice and enjoy every scrumptious bite. The stainless steel insures stability and durability and they are a great to grab as an extra tray for when you’re on the go. The microwave and oven option makes these taco holders especially convenient to use. They are great for the family to enjoy a mess-free dinner and make a great gift for homeowners too! PERFECT PLACE TO HOLD TACOS: These chic and elegant stainless steel taco holders are a perfect way to hold your tacos so they don't cause a mess and spill. These taco rack holders can hold three to four hard or soft tacos and stand great upright in its place. Enjoy having your hands free to fill your tacos with meat, sauces or cheeses, till you're ready to dig in. SERVE TACO IN STYLE: Great taco holder stand option as a classy serving tray to hold your tacos. Serve your tacos in style without them tipping in your plate. Guests will admire the clever way you present your tacos without the mess that comes along with it. 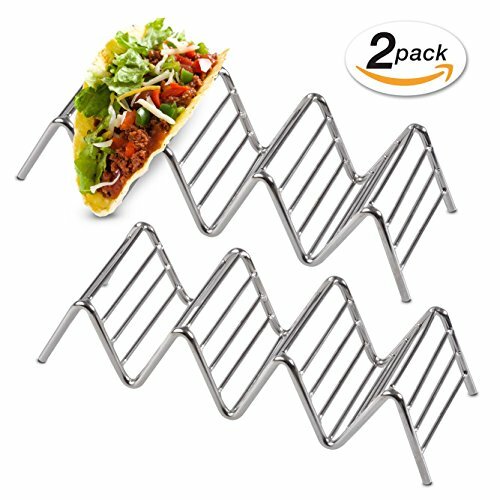 These taco racks can hold 4-5 tacos in its tray so just display the taco shells and let your family fill it with the delicious fillings of their choice. FINEST QUALITY TACO HOLDERS STAINLESS STEEL: Made of high-quality craftsmanship to insure long-lasting stability. Stainless steel material is strong and durable which means it will not chip or break. And the great shape of these racks means they stack easily allowing you to save much needed cabinet space. EASY CARE TACO HOLDER STAND: These taco stands are oven safe which makes it really easy to use. Heat up your food in style with these elegant trays. Or throw it in the dishwasher for easy cleaning without the fuss. The stainless steel makes it really easy to wash by hand too. Its multiple conveniences make these racks a breeze to use and clean. 100% SATISFACTION GUARANTEED: We know you'll love these stylish taco rack holders but if not, you're backed by 60 days of a full refund, no questions asked. Contact us with any questions you might have, our primary aim is our customers satisfaction, and we will help you in any way we can. If you have any questions about this product by TacoWize, contact us by completing and submitting the form below. If you are looking for a specif part number, please include it with your message.